R.G. Ortiz Funeral Home - New York is located in the Upper West Side of Manhattan, less than 1/2 mile from Central Park. The funeral home and cremation chapel is easily accessible via Henry Hudson Parkway and is set within 6 miles of two cemeteries: Calvary & Allied Cemeteries and New York Marble Cemetery. There are a number of funeral facilities under the R.G. Ortiz name. The 72nd Street location is housed in a 5-story midrise, which is clad in dark stone tiles on the first floor and light stone on the upper four levels. Street parking is available in front of the structure. A family business, R.G. Ortiz Funeral Home is owned and operated by Michael Ortiz. Each branch of this franchise keeps a small staff to ensure personalized care is provided to each family. Funeral services can be customized to meet the needs of every client of R.G. Ortiz Funeral Home, and there are a number of cremation options available, as well. Embalming and direct cremation services are available and families can choose hearse and limousine transportation services to the burial grounds. The prices below are based on the General Price List for R G Ortiz Funeral Home - New York. However, funeral homes sometimes have special pricing packages available, and you should ask if those are available. Please let the funeral director know that you found R G Ortiz Funeral Home - New York on Parting.com to allow us to continue helping families like yours. 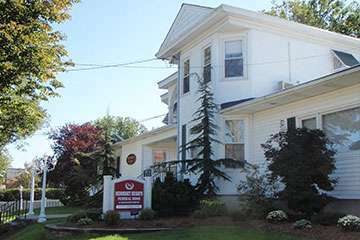 The funeral directors at R G Ortiz Funeral Home - New York are available to provide you with expert advice.